Background: With the decrease in junior doctor hours, the advent of specialist registrars, and the availability of highly trained and experienced nursing personnel, the service needs of patients with chronic respiratory diseases attending routine outpatient clinics may be better provided by appropriately trained nurse practitioners. Methods: A randomised controlled crossover trial was used to compare nurse practitioner led care with doctor led care in a bronchiectasis outpatient clinic. Eighty patients were recruited and randomised to receive 1 year of nurse led care and 1 year of doctor led care in random order. Patients were followed up for 2 years to ensure patient safety and acceptability and to assess differences in lung function. Outcome measures were forced expiratory volume in 1 second (FEV1), 12 minute walk test, health related quality of life, and resource use. Results: The mean difference in FEV1 was 0.2% predicted (95% confidence interval –1.6 to 2.0%, p=0.83). There were no significant differences in the other clinical or health related quality of life measures. Nurse led care resulted in significantly increased resource use compared with doctor led care (mean difference £1497, 95% confidence interval £688 to £2674, p<0.001), a large part of which resulted from the number and duration of hospital admissions. The mean difference in resource use was greater in the first year (£2625) than in the second year (£411). Conclusions: Nurse practitioner led care for stable patients within a chronic chest clinic is safe and is as effective as doctor led care, but may use more resources. Bronchiectasis is a chronic, usually progressive, respiratory disease characterised by dilatation and thickening of the bronchi. Patients experience repeated episodes of infection, chronic sputum production, and increasing breathlessness, ultimately progressing to respiratory failure. It accounts for one in 200 hospital admissions in England1 and causes approximately the same number of deaths as multiple sclerosis each year in England and Wales, and 25% of the number of deaths from hypertensive disease (ICD 9 codes 401–405).2 Despite this, there has been little concerted effort to optimise management of such patients. The Lung Defence Clinic was introduced at Papworth Hospital in July 1995 to streamline the management of patients with bronchiectasis. At initial referral patients are seen by either a consultant or a registrar and are investigated for causal factors for, and precipitants of, bronchiectasis. Individual management plans are developed for intensive treatment and prophylaxis of endobronchial sepsis. Following initial investigation patients with minor disease are followed up in their local hospitals, returning to the tertiary centre for annual review. Patients with moderate to severe disease are seen in the Lung Defence Clinic at Papworth approximately four times per year. With the decrease in junior doctors hours, partly due to the working time directive and the advent of specialist registrars, there is a pressing need to address the service requirements for patients with chronic lung diseases including bronchiectasis. In many patients with bronchiectasis routine monitoring and minor modifications of treatment could be managed by appropriately trained nurse practitioners in nurse practitioner led clinics, ensuring continuity of care but freeing up senior medical staff. More consultant time could then be spent on increasing the throughput of new patients who would have their care optimised and treatments reassessed. Early studies of the roles of nurse practitioners indicated that the care provided by them may be equivalent to that provided by physicians in some circumstances.3–7 However, many studies had methodological limitations8 and results from the USA may not be generalisable to the UK.9 Little has been published on the role of a nurse practitioner in a UK setting. We report results of a randomised controlled crossover trial comparing nurse practitioner led care with traditional doctor led care in a bronchiectasis outpatient clinic. The broad aims were to assess the feasibility and safety of nurse led outpatient clinics and to compare the cost effectiveness of nurse led and doctor led care. Specific aims were to measure the difference in clinical measures, health related quality of life, and cost of service delivery between nurse practitioner led and doctor led care in the bronchiectasis clinic, the primary outcome being forced expiratory volume in 1 second (FEV1). When the study began there was no recognised training course with educational approval, so a course was developed and is currently being assessed for university and school of nursing approval. The core curriculum involves the principles of disease and clinical presentation, underlying causes, associated pulmonary disorders, pulmonary function and microbiology. Training included a radiation protection course and in-hospital training in pharmacology and therapeutics to enable prescribing and the ordering of radiographs, blood tests, and pulmonary function tests in accordance with the treatment plan. The nurse practitioner attended tutorials, clinics, post-clinic patient reviews, and ward rounds, with detailed discussion of changes in practice with the attending consultant and the patient. A detailed curriculum is available from the authors or from the NHS health technology assessment reports website (www.nechta.org). The study was a two period, two treatment crossover trial with patients receiving two 1 year blocks of care led by either a nurse practitioner or medical staff. The order of care was randomised. Two consultants and one registrar with 2–3 years of experience in respiratory medicine made up the medical staff team. Carryover effects were considered negligible in this context, so no washout period was used. Patients aged ≥18 years with bronchiectasis confirmed by high resolution CT scan and with an established treatment plan were included in the study. The nurse practitioner did not assess newly referred patients independently. Patients with a life expectancy of less than 2 years, those with an expected need for transplant listing within 2 years, patients with FEV1 less than 30% predicted, and those with other significant pathology which would modify the management of bronchiectasis were excluded. One hundred and forty nine patients were identified from the Lung Defence Clinic during the nurse practitioner training period. Of these, 40 were unsuitable for the trial because of relocation (4), mild bronchiectasis cared for in the local hospital (13), no management plan (6), FEV1 <30% (7), age <18 years (1), or other medical conditions requiring complex management (9). Of the 109 eligible patients, seven refused or did nor reply to recruitment letters. Of the remaining 102 patients the first 80 attenders at the clinic were recruited (fig 1). All patients gave written informed consent and the study was approved by Huntingdon research ethics committee. Flow chart of patients considered for the trial. Sample size was calculated on the basis of establishing equivalence of nurse practitioner led care and doctor led care. We aimed to exclude a difference in FEV1 of ≥5% predicted between the two methods of care delivery. We assumed standard deviation of 12.5%, at least 80% power, two tailed alpha of 5%, and 10–15% of patients dropping out of the study. Using standard methods,10 the required sample size was 80 patients. Randomisation was organised independently of the investigators using numbered opaque envelopes containing a registration form and group allocation. Randomisation used a random permuted block design with blocks of length 4 and 6 to ensure a roughly constant case load throughout. During nurse practitioner led care patients had routine tests followed by a consultation with the nurse involving clinical assessment and discussion of management plan. The nurse practitioner made changes to treatment and ordered further tests such as radiographs and blood tests as appropriate. Supervision sessions were held within 24 hours of the clinic to discuss each patient’s condition and management. If the consultant would have taken a different course of action the patient was informed immediately and arrangements made to amend management. The difference between FEV1 measures at the end of each year of treatment was the primary measure of the effect of nurse practitioner led care. This was considered the most sensitive and reproducible marker of underlying lung function related to bronchiectasis. Secondary outcome measures were forced vital capacity (FVC), 12 minute walk, number of infective exacerbations requiring intravenous antibiotics, number of admissions to Papworth and local hospitals, health related quality of life, cost of care, and nurse practitioner autonomy. Clinical measures were recorded by technicians independent of the trial. The SF-36 has eight dimensions: physical functioning, role limited due to physical problems, role limited due to emotional problems, social functioning, mental health, energy/vitality, pain, and general health status. Dimensions are scored from 0–100 with 100 representing maximum health status. The CRIQ measures dyspnoea, fatigue, emotional function, and mastery of disease and is the most sensitive and comprehensive disease specific measure for respiratory conditions.12,14 The CRIQ dimensions are 24–42 point scales with high scores representing maximum health status. The St George’s Questionnaire13 measures levels of symptomatology, physical activity and impacts and has been validated in patients with bronchiectasis.15 Scores range from 0–100 with 0 representing maximum health status. All questionnaires were completed by patients without assistance, although a research assistant not involved in the care of the patients was available in clinic to address queries and to ensure completion. Where medical staff gave advice or altered management at supervisions during nurse practitioner led care, it was documented. These data were used to measure nurse practitioner autonomy, to monitor adverse events, and to modify the training package if appropriate. The primary economic evaluation was a cost minimisation analysis from the National Health Service perspective.16 Resources used for outpatient visits, tests and procedures, drug prescriptions, hospital admissions, and general practice visits were identified for every patient at 6 month intervals throughout the trial. At each outpatient visit information on the length and date of the visit and investigations and procedures ordered was elicited. Microbiological and immunological tests were obtained from hospital databases. Inpatient admissions were abstracted from the hospital Patient Administration System. Patient diaries were used to collect information on drug usage (name, dose, frequency and duration), GP visits, and care received at other hospitals. Outpatient drug prescriptions were validated from the medical record. Papworth hospital finance department provided unit costs of tests, procedures, and inpatient admissions. Published unit costs were used for admissions to other hospitals,19 drugs,20 and primary care consultations.17 The cost of a doctor led clinic was based on published unit costs for the patient related time of medical consultants and specialist registrars.17 The same method was used for nurse led clinics assuming a mid point grade G salary with appropriate oncosts, qualifications, and ongoing training (see table 1).17 Sensitivity analysis was used to examine the importance of our assumptions. Overheads were considered to be equivalent among doctor and nurse led clinics. All costs are reported in 1999/2000 values and were not discounted. The approach to analysis followed Hills and Armitage,21 using paired Student’s t tests to assess the significance of the effect of mode of care (nurse practitioner led care compared with doctor led care) and time period (first year compared with second year in the trial). Changes between the two time periods were tested but no important period effects were observed and these are not reported further. No carryover was assumed at the design stage. However, given observed differences between periods in the economic analysis, post hoc tests of carryover in clinical outcomes were assessed and found to be non-significant. They are not reported further here. Means and 95% confidence intervals (95% CI) for FEV1 were presented along with effects of mode of care. Similar methods were used to assess changes in health related quality of life scores. A bootstrap confidence interval was used to assess differences in costs. Infective exacerbations and admissions to hospital were expressed as the number per patient year of follow up. These measurements were assumed to follow a Poisson distribution and modes of care were compared using a likelihood ratio test. All patients who failed to complete the trial period were documented. Patients who failed to crossover to nurse practitioner care were included in the trial on an intention to treat basis. A secondary analysis of the primary outcome was performed which excluded these patients and treatment effects were almost identical (not presented). Two patients died just after the 12 month follow up, one from a perforated bowel (nurse practitioner led group) and one from respiratory failure (doctor led group). One patient did not undergo any pulmonary function or exercise tests at the 2 year visit due to a fractured rib, unrelated to bronchiectasis. These patients were excluded from the analysis of FEV1. Two patients were unable to complete the 12 minute walk test, one because of a fractured toe (12 months) and one who was too sick (24 months); both had doctor led care in the previous year. Otherwise, all patients completed the clinical outcomes. Two different patients refused to complete quality of life interviews, one at 12 and one at 24 months, both at the end of nurse practitioner led care. Six patients who received doctor led care in the first 12 months required revised management plans during this time which prevented crossover to nurse practitioner led care. Of the 80 patients recruited, 39 were randomised to receive nurse practitioner led care followed by doctor led care and 41 to doctor care followed by nurse care. Mean (SD) age at randomisation was 58.3 (13.3) years. Fifty five (69%) recruits were women. These characteristics were similar to those of patients who were not recruited to the study. Baseline lung function and 12 minute walk were similar in the two groups (table 2). Table 3 shows the clinical measures observed at the end of each treatment period. The mean difference in FEV1, the primary end point, between nurse practitioner and doctor led care was 0.01 l (95% CI –0.04 to 0.06, p=0.79) or 0.2% predicted (95% CI –1.6 to 2.0, p=0.83). In addition, there was no change in FVC between the two treatment periods (mean difference –0.02% (95% CI –1.5 to 1.4), p=0.84). The mean difference in 12 minute walk between the two methods of service delivery was 18 m (95% CI –13 to 48). This analysis was repeated excluding those patients who failed to crossover to nurse practitioner led care with very little change in the size or precision of results. The number of infective exacerbations experienced by patients during nurse led care was 262 in 79.4 patient years of follow up compared with 238 in 77.8 years during doctor led care. Thus, nurse practitioner led care resulted in a relative rate of exacerbations of 1.09 (95% CI 0.91 to 1.30), p=0.34. During doctor led care there were 42 admissions to hospital compared with 66 during nurse led care, a relative rate of 1.52 (95% CI 1.03 to 2.23), p=0.03. Of these, there were 23 and 43 readmissions related to their bronchiectasis, a relative rate of 1.59 (95% CI 0.75 to 3.39), p=0.22. Figure 2 shows the effects of mode of care on the SF-36 profile scores. There were no significant differences although patients did report fewer role limitations due to emotional problems, less vitality/energy, and greater levels of pain following doctor led care. Mean differences and 95% confidence intervals for SF-36 profile scores between nurse practitioner led and doctor led care. Disease specific questionnaire results are shown in fig 3. There were no clinically or statistically significant differences between the two methods of service delivery. 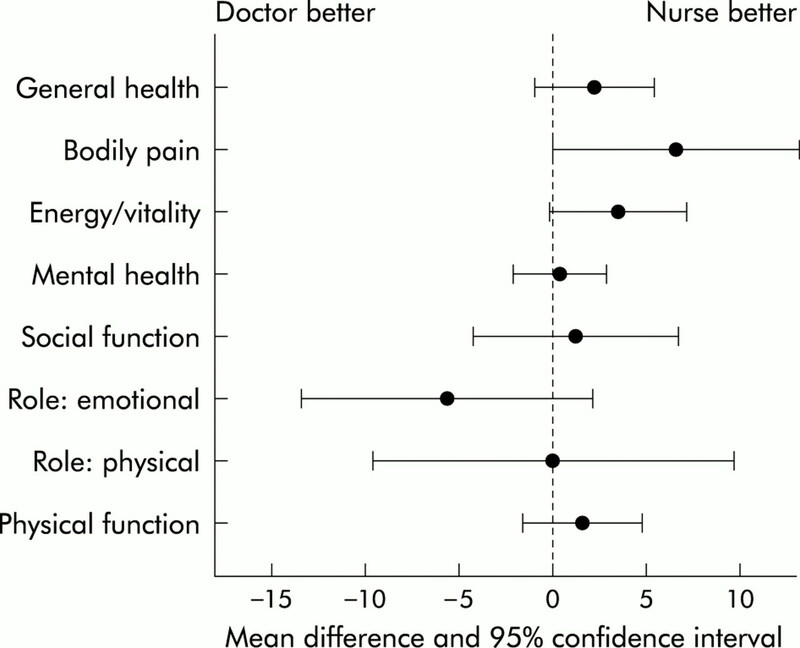 Mean differences and 95% confidence intervals for disease specific health related quality of life scores between nurse practitioner led and doctor led care. The unit cost of the nurse practitioner (see table 1) was under half that of the consultant. However, patients receiving nurse practitioner led care had more clinic visits per year (5.06 v 4.48, table 4) and, on average, nurse led clinic visits lasted longer (26 minutes v 20 minutes). In combination, these factors almost negated the lower unit cost of the nurse practitioner (table 4). With the exception of GP visits, the nurse practitioner incurred greater costs in all other resource use indicators. This was especially evident for inpatient admissions (£861 more) and prescribed antibiotics (£516 more). Inpatient visits occurred more frequently under nurse led care (see above) and tended to be of longer duration (10 days v 7 days). Antibiotic prescribing also differed substantially, with three drugs (intravenous meropenem and ceftazadime and colistin nebuliser) leading to over 80% of the difference. Overall, nurse practitioner led care resulted in significantly increased costs compared with doctor led care (£1497 (95% CI £688 to £2674)). During the trial period the nurse completed 436 consultations with patients. There were three occasions where the consultant requested further action. In one case the patient was prescribed antibiotics by the nurse but the consultant was keen to redefine the patient’s specific antibody deficiency. At the consultation the nurse practitioner had discussed further investigations but the patient felt well and was reluctant to undergo further tests. The impact of this was considered minor. The second patient was well and planning a transatlantic holiday. The nurse practitioner failed to order blood gas tests to identify a need for oxygen therapy during the flight. The impact of this was considered moderate. The patient was contacted and returned for blood gas assessment. The third patient had diverticulitis which was not being addressed. The nurse practitioner brought it to the attention of the consultant at the post-clinic meeting where further action was planned. In this case the nurse behaved entirely appropriately as further action outwith her specialist area was required. This study has shown that nurse practitioner led and doctor led outpatient care are equivalent for stable patients with moderate to severe bronchiectasis with established management plans. A crossover design estimates within patient change and is therefore sensitive to small effects on clinical and quality of life outcomes. We concentrated on important and sensitive markers of change in health status, with FEV1 the primary outcome. Nurse led care maintained FEV1 and FVC within 2.0% (upper limit of 95% CI) of doctor led care, which is well within the limits of random fluctuation.22 Similarly, the Chronic Respiratory Questionnaire14 and the St George’s Questionnaire15 have been validated in patients with chronic lung disease and have proved sensitive to changes in function. In these dimensions there was a small non-significant trend towards better patient reported quality of life following nurse practitioner led care. The only demonstrable difference in clinical outcomes was an excess of admissions under nurse led care, although the readmissions for bronchiectasis related problems were not significantly different. All hospital admissions are authorised by a consultant and, on review, all admissions recommended by the nurse practitioner were judged appropriate. The hospital admission rates were 0.83 per patient year for the nurse and 0.54 for the doctors. Corresponding rates for chest admissions were 0.54 and 0.30 per patient year, respectively. These rates are low for bronchiectasis and the difference is not clinically significant. Despite using sensitive end points and methodology, it is possible that some unexpected changes in health status may have occurred due to the introduction of nurse practitioner led care, and continued audit of the service may be warranted. In this study the nurse practitioner used more resources than the medical team, mainly resulting from increased admissions and antibiotic use. Intravenous antibiotics and admissions are authorised by consultants and this difference may reflect variation in practice between individual doctors. The nurse practitioner protocol was determined by a single consultant who was also responsible for training. Other medical staff may have different thresholds for patient admissions. Two patients underwent procedures during nurse practitioner care which resulted in a cost difference of over £20 000 and £30 000, respectively. Over 80% of the difference in antibiotic costs was due to three drugs—two were administered intravenously, a practice which needed medical authorisation, and the third was colistin nebulisers which are used as routine care for some of these patients. One weakness of this study is that we may not have all the prescriptions issued by general practitioners since patients were required to record this information. Because the nurse practitioner was required to record prescriptions and tests issued at the clinic, we believe that she is more likely to have ensured that patients left with supplies of routine treatment. Doctors have a greater awareness of hospital budgeting and may have shifted some costs to general practitioners. There was evidence of a learning effect over time. The cost of nurse led care per patient was £5202 in the first year and £3262 in the second, compared with £2577 in the first year of doctor led care and £2851 in the second. Since some patients did not cross over to nurse led care, we cannot delineate the learning effect from a selection effect. However, the extent of convergence suggests that, with further modification of the protocol, costs for nurse led care can be brought into line with those for doctor led care. If the increase in costs incurred by nurse led care can be limited to the first year, it may be considered worthwhile since it frees up the consultant to see new and clinically demanding patients. Sensitivity analysis showed that cost estimates were robust to changes in assumptions regarding training, supervision, and cost of the nurse practitioner. Any changes to these assumptions were heavily outweighed by the observed differences in prescribing and admissions. Early descriptive studies of the role of the nurse practitioner in evaluating safety, management competence, and patient satisfaction were promising.3–7 These studies were flawed because of a lack of appropriate controls, small sample sizes, lack of randomisation, failure to account for differences in severity of illnesses, and failure to measure outcomes.8 Also, American results may not be transferable to a UK setting.9 In the UK there have been randomised controlled trials of nurse specialists compared with doctor led care in neurosis,23 stroke patients,24 rheumatology,25 Parkinson’s disease,26 and for telephone consultations in out of hours primary care.27 However, with the exception of the primary care nurse, none of these roles extended beyond the traditional nursing domain. Respiratory nurse specialists are well established28; their role has been predominantly in patient support, education and community liaison29. In this study, expanding the role of the nurse practitioner to include follow up provided an effective and acceptable method of delivering care in a hospital outpatient setting. To our knowledge, this is the first published randomised controlled trial of the role of a nurse practitioner in secondary/tertiary care, which has a greater medicotechnical component than the nurse specialist in the UK. Appropriate training of the nurse practitioner was central to the outcome and safety of this study. To practise independently, the nurse acquired detailed knowledge of bronchiectasis and its management, and practical experience in clinical assessment and therapeutics. She had some previous experience so this took 6 months to achieve, although in other circumstances this phase could last for 9–12 months. Successful completion of this stage is considered a vital prerequisite to undertaking of this role successfully. The extent to which this study can be extrapolated to other clinics needs discussion. The study involved a single nurse practitioner in one bronchiectasis clinic in one hospital. While the treatment and management of patients is broadly generalisable to other chronic disease clinics, we would not recommend extrapolation of the results to acute onset diseases or diseases in which the presentation and/or complications are wide ranging or rapidly changing—for example, malignant disease clinics. In addition, all patients recruited had an established care plan and results may not be generalisable to new referrals to bronchiectasis clinics. The nurse practitioner in this study had long experience of working with cardiothoracic patients in a tertiary centre, was at a senior level (G/H), and had a degree. Both academic and professional competence have been important to the successful development of this role. This study has shown, within the context of a randomised controlled trial of crossover design, that nurse led care for stable patients within a chronic chest clinic is safe and is as effective as doctor led care. 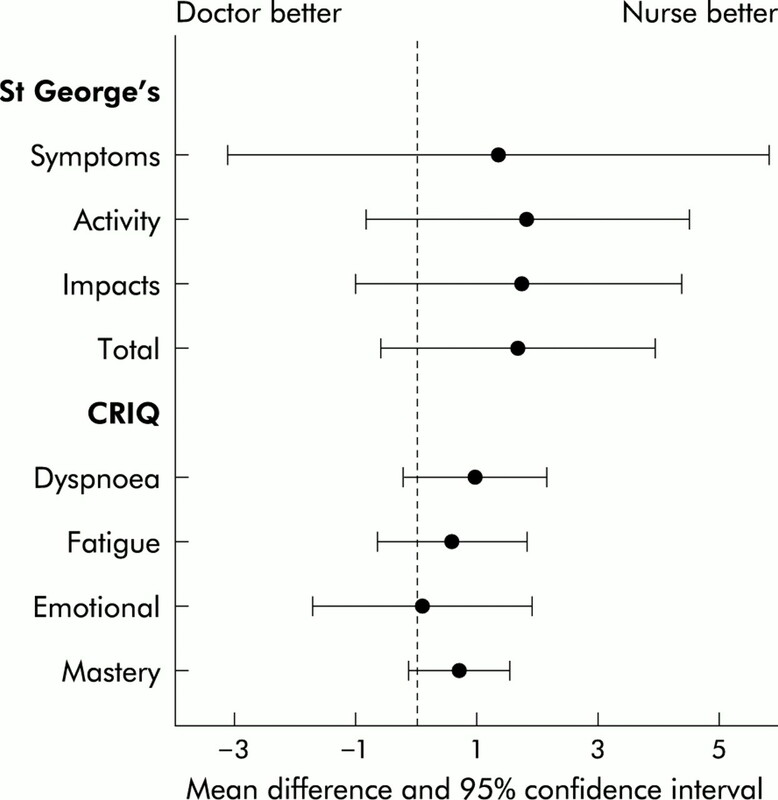 Not only were there negligible differences in the important clinical and quality of life measures, but confidence intervals were small enough to exclude, with high probability, a detrimental effect of introducing nurse led care. Nurse practitioner led care may be more costly in terms of resource use than doctor led care. The authors thank all the patients and professionals who were involved in the trial, particularly the staff who took part in training the nurse practitioner. We also thank the trial’s research assistant, Denise Hodgkins, and Nikki Kearsley and Gordon Taylor for their contributions to trial management. The research was funded by the NHS R&D Health Technology Assessment programme. The views expressed in the paper are those of the authors. Department Of Health. Hospital episode statistics, England: financial year 1998–99. London: Department of Health, 2000. Office for Population Census and Surveys. 1992 mortality statistics, England and Wales. London: Her Majesty’s Stationery Office, 1993. Ford L, Silver HK. The expanded role of the nurse in childcare. Nursing Outlook1967;15:43–5. Spitzer W, Sackett D, Sibley J. 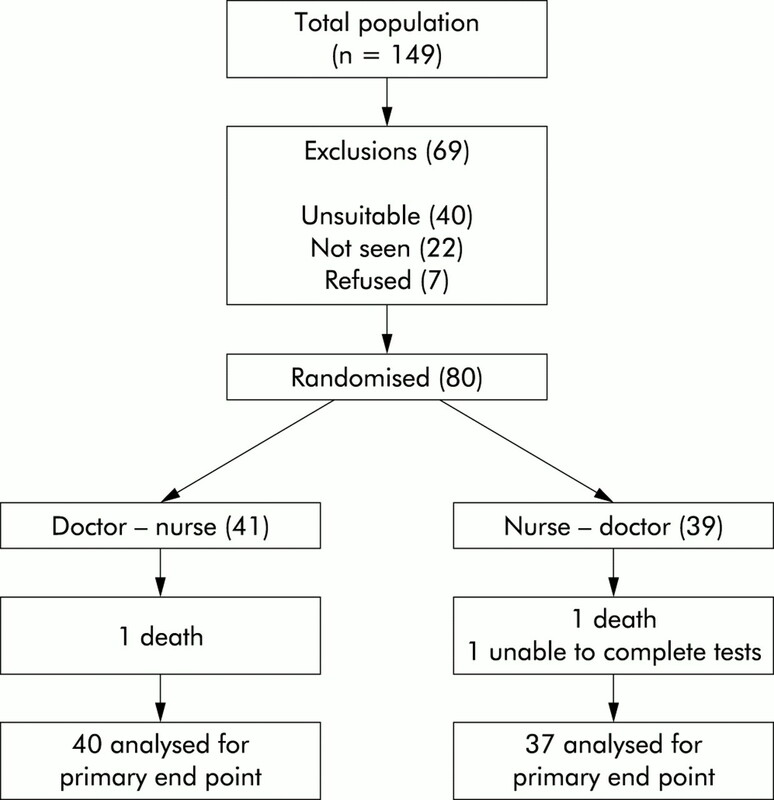 The Burlington randomised control trial of the nurse practitioner. N Engl J Med1974;290:251–6. Davidson RA, Lauver D. Nurse practitioner and physican roles: delineation and complementarity of practice. Res Nursing Health1984;7:3–9. Salisbury C,Tettersell M. Comparison of the work of a nurse practitioner with that of a general practitioner. J R Coll Gen Pract1988;38:314–6. Wade B, Moyer A. An evaluation of clinical nurse specialists: implications for education and the organisation of care. Senior Nurse1989;9:1–16. Mundinger MO. Advanced practice nursing: good medicine for physicians? N Engl J Med1994;330:211–3. Newbold D. An evaluation of the role of the nurse practitioner. Nursing Times1996;92:45–6. Jones B, Jarvis P, Lewis JA, et al. Trials to assess equivalence: the importance of rigorous methods. BMJ1996;313:36–9. Brazier JE, Harper R, Jones NM, et al. Validating the SF-36 health survey questionnaire: new outcome measure for primary care. BMJ1992;305:160–4. Jones PW, Quirk FH, Baveystock CM, et al. A self-complete measure of health status for chronic airflow limitation: the St George’s Respiratory Questionnaire. Am Rev Respir Dis1992;145:1321–7. Stewart AL, Greenfield S, Hays RD, et al. Functional status and well-being of patients with chronic conditions: results from the medical outcomes study. JAMA1989;262:907–13. Wilson CB, Jones PW, O’Leary CJ, et al. Validation of the St George’s Respiratory Questionnaire in bronchiectasis. Am J Respir Crit Care Med1997;156:536–41. Briggs AH, O’Brien BJ. The death of cost-minimisation analysis? Health Econ2001;10:179–84. Netten A, Curtis L. Unit costs of health and social care 2000. Canterbury: University of Kent, 2000. Drummond M, O’Brien B, Stoddart G, et al. Methods for the economic evaluation of health care programmes. 2nd ed. Oxford: Oxford University Press, 1997. NHS Executive. Reference costs 2000. London: NHS Executive, 2000. Duncan C. Monthly index of medical specialities (MIMS). London: Haymarket Medical Ltd, 2000. Hills M, Armitage P. The two-period crossover clinical trial. Br J Clin Pharmacol1979;8:7–20. Marks IM. Psychiatric nurse therapist. In: Primary care. The expansion of advanced clinical roles in nursing. London: RCN, 1985. Forster A, Young J. Specialist nurse support for patients with stroke in the community: randomised controlled trial. BMJ1996;312:1642–6. Lattimer V, George S, Thompson F, et al. Safety and effectiveness of nurse telephone consultations in out of hours primary care: randomised controlled trial. The South Wiltshire Out Of Hours Project (SWOOP) Group. BMJ1998;317:1054–9. Cockcroft A, Bagnall P, Heslop A, et al. Controlled trial of respiratory health worker visiting patients with chronic respiratory disability. BMJ1987;294:225–7. Castledine G, McGee P. Advanced and specialist nursing practice. London: Blackwell Science, 1998. Conflicts of interest: Jane Edmunds was the nurse practitioner and Diana Bilton, Mary Keogan and Andrew Exley were consultants directly involved in the care of the trial patients. The data collection and day to day management of the study was the responsibility of Denise Hodgkins and the analysis and interpretation of results was the responsibility of the statistician Linda Sharples, both independent of trial patients and staff.